Our commitment is to offer you a clean & comfortable stay at a fair price." 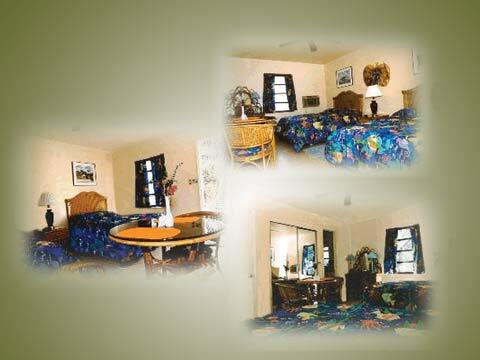 Each room is newly decorated and has air conditioning, two double beds, wicker furniture, small kitchen and TV with HBO. The Sandpiper Motel is convenient to all local activities including diving, snorkeling and fishing. Our cozy motel is just 1/2 mile from the famous Seven Mile Bridge. Nearby is the delightful Crane Hammock Museum of Natural History with its 63 acres of nature trails. Historic Pidgeon Key and many fine restaurants are also just down the street. Also, the Dolphin Research Center is a mere 15-minute drive and Key West is only 45 miles down the road. The Sandpiper offers visitors all the beauty and activities of the Florida Keys without the high cost of Key West hotels. Come and experience the beauty of the Keys. WATERSPORTS & FISHING: There are many things to do and see in the Central Florida Keys and Marathon area where we are located. We have some of the best diving and sport fishing in the World and depending on the time of year offer Tarpon, Permit, Bonefish, Kingfish, Wahoo, Marlin and Sailfish to name just a few. There are also all types of boat rentals including sailboats and jet skis in the immediate vicinity. Other things to do include: THE DOLPHIN RESEARCH CENTER - TOURS - Dolphin Research Center is just 15 minutes away and offers narrated dolphin and sea lion behavior sessions every half an hour from 9 a.m. to 4 p.m., 7 days a week. Sessions may include training of new behaviors, research trials, dolphin playtime, fun facts and much more! Admission prices: $17.50 for adults, $14.50 for seniors (55 and older), $11.50 for children 4-12 years old. Children under 4 admitted free with adult. Discount tickets are available from the Sandpiper Motel. Dolphin Encounter (swim program) and DolphinSplash (wade-in program) are available by reservation. Call 305-289-0002. Meet the Dolphin, Paint with the Dolphin and other programs are available on a walk-in basis. For more information about DRC's programs, visit www.dolphins.org. DOLPHINLAB - Dolphinlab is a college-accredited program which allows participants to spend a week immersed in the world of dolphins. CRANE POINT HAMMOCK - Is located right next door to us at mile marker 50.5 and offers a museum of natural history and 63 acres of natural landscape with nature trails. At the Hammock you can also see a such things as a restored Bahamian conch house and makeshift rafts used to escape the clutches of Cuba's dictator, Fidel Castro. You can also get close to nature with the Hammock's sea life "touch" tanks. Admission is $7.50 per adult, children under are 6 free, seniors are $6.00. For more information call (305)743-9100. Discount tickets are available at the Sandpiper Motel. PIDGEON KEY - Tours to this unique island adventure leave from the Pidgeon Key Visitor's Center. The Center is a short distance from the Sandpiper Motel at mile marker 47. The Pidgeon Key tour trolley leaves every hour from 10:00 A.M. till 4:00 P.M.. This family adventure is an excellent experience in enjoying the natural environment of the Keys. The restored 1990's buildings are home to many interesting details of the construction of the original Seven Mile Bridge. There is a gift and book shop on the island. See the museum, relax at the dock and enjoy the adjacent open-water picnic area. You may call them at 305-743-5999. Discount tickets are available at the Sandpiper Motel. SEVEN MILE BRIDGE - Before enjoying a dinner in one of Marathon's fine restaurants, you may want to park your car at the entrance to this expansive bridge and take a leisurely stroll on it, enjoying unobstructed views of both the Gulf of Mexico and the Atlantic Ocean. The delightful breezes and the colors of the setting sun from this vantage point are s wonderful & FREE experience. KEY WEST - Key West is only 40 minutes away by car (see map) and offers visitors a variety of shopping, activities, restaurants and night life not available in the upper Keys. Visit the coral reefs, Mel Fisher Treasure Museum, the Ernest Hemingway House or simply knock back a few at the world famous Sloppy Joe's or Hogg's Breath Saloons. Key West is, however, expensive and that is why increasing numbers of visitors to the Keys have been opting for the more reasonably priced lodging and more laid back lifestyle of the middle and upper Keys. Day trips from Marathon to Key West will make your stay in the Keys more economical. DRY TORTUGAS - Some seventy odd miles from Key West lie a little known group of islands known as the Dry Tortugas. These islands are only accessible by ferries and seaplanes that depart and return daily from Key West.